General Motors fancies itself as a diverse user of the world’s energy. Chevrolet, for example, sells vehicles that use alternative fuels such as E85 while Cadillac offers the hybrid version of its Escalade SUV. And lest we forget about the fact that GM is hard at work on the (possibly) game-changing Chevy Volt. Taking GM’s energy efforts one step further, The General’s Australian arm Holden has become part of a consortium with intentions to explore the feasibility of an E85 alternative fuel facility in Australia. The coalition is made up of Caltex, Coskata, Mitsui, and Velocia – in addition to the government of Victoria. The initiative would result in the first alternative fuel plant in Australia and would lead GM’s Holden to make vehicles capable of running on E85. E85 fuel is 15 percent gasoline and 85 percent Ethanol, the latter usually being made from corn or another food source. The innovative facility in question, however, would convert garbage and waste into Ethanol fuel and have the capability of producing almost 57 million gallons of E85 per year. This development takes GM’s E85 initiative a big step further. GM is the undisputed leader in E85 technology in the United States with its FlexFuel vehicles, of which there are more than 3.5 million on U.S. roads today. While each of the companies in the consortium are dedicated to sustainable fuels in an effort to reduce oil dependence and decrease harmful emissions, GM’s share is to produce vehicles capable of running on E85 fuel in Australia. Caltex – on the other hand – is supposed to install fuel pumps in Australia, including 30 E85 stations in metropolitan areas this year and 100 more in 12 months. Meanwhile, Coskata – an organization that has a rare facility capable of producing E85 from waste – will be expanding its operations to Australia. Coskata’s Chief Marketing Officer addressed one of the concerns of crop growers about E85, annoucing that “we don’t make fuel from food crops, we use sources like municipal waste that have reached the end of their lifecycle and turn them into renewable energy.” As such, Coskata will not be taking feedstock away from people and/or animals to produce Ehtanol for E85-capable vehicles. Further environmental benefits were brought forth by Simon Tori from Velocia Environmental Services. He described that “deriving energy from municipal, commercial and industrial waste that is otherwise bound for landfill, is an exciting possibility” for Veolia and the local government. Seeing its popular FlexFuel technology available on a global scale is vital for General Motors’ competitive advantage worldwide. And while our fellow Australians get such awesome vehicles as the Zeta-based Commodore and Statesman, what they haven’t been able to get their hands on are GM’s FlexFuel products that have been sold in the United States for almost a decade. 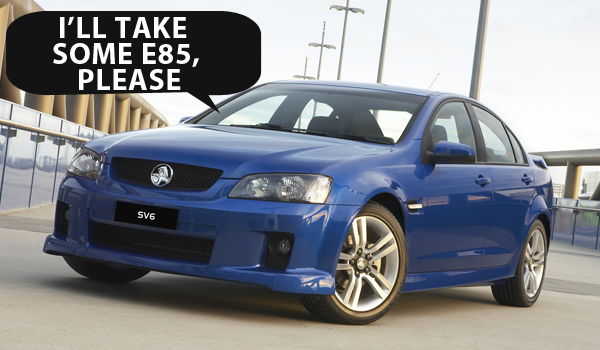 But in a classic case of having one’s pie and eating it too – the first Australian-made car that’s able to run on E85 will be a Holden Commodore! Each company in the consortium provides details about their technology as well as frequently asked questions in the press release below. Previous story Hot Or Not: Camaro Tattoo?